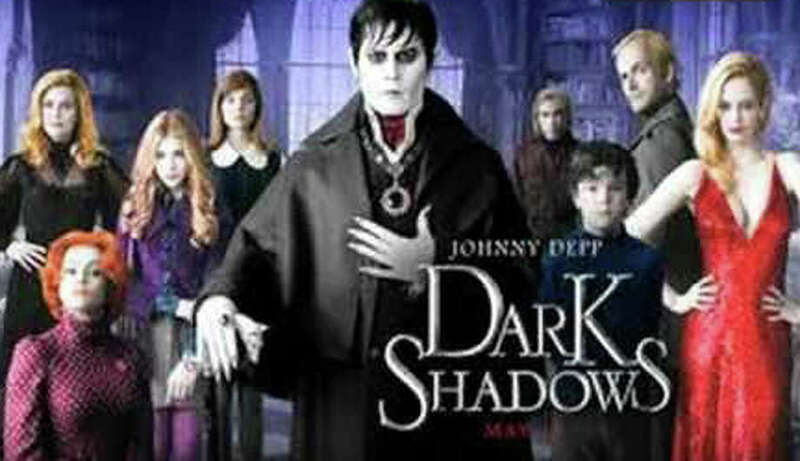 "Dark Shadows," the movie interpretation of television's horror soap opera from the 1960s, is playing in area theaters. Slyly laced with weird, supernatural humor, Tim Burton returns to the story of the cult 1960s television soap opera with deliciously demonic Johnny Depp as Gothic vampire Barnabas Collins. In 1750, young Barnabas sailed from Liverpool with his parents, who built a fishing empire in the coastal Maine town known as Collinsport. But Barnabas fell in love with beautiful Josette (Bella Heathcote), infuriating Angelique (Eva Green), a witch who killed Josette and cursed Barnabas for eternity. Some 196 years later, when his crypt is accidentally excavated, Barnabas elegantly emerges into 1972, bewildered by cars and TV sets, not to mention lava lamps, which he calls "pulsating blood urns." Despite the efforts of its caretaker (Jackie Earle Haley), Barnabas's ancestral home, Collinswood Manor, is in ruins, as the financially-strapped family matriarch (Michelle Pfeiffer) tries to cope with her angry, rebellious teenage daughter (Chloe Grace Moretz). Barnabas's arrival coincides with that of a young governess, Victoria (Bella Heathcote), persecuted because of her mysterious psychic gift. Victoria's charge is 10 year-old David (Gully McGrath), who talks to his dead mother and is neglected by his wastrel father (Jonny Lee Miller), despite efforts of the Collins' resident psychiatrist (Helena Bonham-Carter). Worst of all, Collinsport has been transformed into Angelsbay, named for its most prominent businesswoman, known as Angie (Eva Green). Declaring, "Family is the only real wealth," Barnabas vows revenge, determined to right the wrongs done over the past two centuries. Imaginative Tim Burton directs from Seth Grahame-Smith and John August's screenplay, based on Dan Curtis's vividly melodramatic ABC-TV series, broadcast weekdays from June 27, 1966, to April 2, 1971, amassing more episodes (1,225) than most other sci-fi series, including "Doctor Who" and "Star Trek." Kudos go to production designer Rick Heinrichs for the atmospheric interiors, Bruno Delbonnel for the eerie cinematography and Danny Elfman for the pulsating score. There are also cameos by Christopher Lloyd and Alice Cooper, plus original cast members Jonathan Frid, Lara Parker, Kathryn Leigh Scott and David Selby. On the Granger Movie Gauge of 1 to 10, "Dark Shadows" is an enduringly escapist 8, a murderously funny fantasy. Nicholas Stoller's comedy revolves around what happens when a couple's career choices challenge their romantic commitment. There's no doubt that Tom Solomon (Jason Segel) and Violet Barnes (Emily Blunt) are in love. They've been inseparable since meeting at a New Year's Eve costume party. When he proposes a year later, she accepts with alacrity. Problem is: setting a date for the wedding. He's a successful sous chef at San Francisco's upscale Clam Bar and she's hoping to do graduate study at the University of California. Instead, she has to settle for a two-year post-doctoral research position at the University of Michigan, working with charismatic Professor Winton Childs (Rhys Ifans) as part of his psychology team (Mindy Kaling, Kevin Hart, Randall Park). In a gesture of support for her career, Tom agrees to postpone their wedding and gamely accompany ambitious Violet to the Midwest, where he tries in vain to a chef job in Ann Arbor and ends up making sandwiches at Zingerman's, a local deli landmark, working with the self-described "pickle nerd" (Brian Posehn). Consoled and counseled by Bill (Chris Parnell), a fellow, stay-at-home faculty spouse, Tom gradually turns into a grizzled mountain-man: hunting deer, keeping bees and brewing mead. Meanwhile, with their nuptials perpetually postponed, Tom's culinary cohort Alex (Chris Pratt) marries Violet's fertile sister Suzie (Alison Brie) and starts a family, in addition to becoming a successful restaurateur. Director Nicholas Stoller ("Forgetting Sarah Marshall," "Get Him to the Greek") co-wrote the contrived, longer-than-necessary script with Jason Segel under the aegis of prolific producer Judd Apatow. Segel and Blunt are an affectionately amiable duo as scene-stealing Chris Pratt delivers comic relief. Problem is that since Tom and Violet are living together, their lives are already intertwined on all practical and emotional levels. So the wedding ceremony is the only missing link, which is not really enough to justify the leisurely two-hour plus running time. On the Granger Movie Gauge of 1 to 10, "The Five-Year Engagement" is a poignant, savvy 7, delivering a relevant, contemporary commentary about socio-economic conflict. Independent writer/director Whit Stillman made an auspicious debut a couple of decades ago with "Metropolitan" (1990) and "Barcelona" (1994), revolving around the articulate, preppie world of what his characters call the "urban haute bourgeoisie," but he hasn't made a movie since "The Last Days of Disco" (1998). Now he's back with this caustic, episodic comedy, another throwback to the rarefied, sophisticated, dance-centric world in which his mind dwells. Set at (fictional) Seven Oaks College, located somewhere in the Northeast, it revolves around a clique of three well-bred co-eds who have perfected vacuous snobbery into a fine art. Scoping out the newbies at orientation, Violet (Greta Gerwig), Rose (Megalyn Echikunwoke) and Heather (Carrie MacLemore) choose lovely Lily (Analeigh Tipson), a transfer student, and offer sincere points on self-improvement while inviting her to join them as condescending do-gooders on campus. In addition to helping her chums dodge unsavory romantic involvements with boorish, unworthy, doofus suitors, like Charlie (Adam Bordy), Xavier (Hugo Becker) Frank (Ryan Metcalf) and Thor (Billy Magnussen), the tight-knit clique's ringleader, Violet Wister, is also determined to rescue severely depressed students by offering not only coffee, doughnuts and counsel but also tap dance therapy at the Suicide Prevention Center that she's established. Violet's greatest ambition -- and what she considers will be her benevolent gift to society -- is introducing a new international dance craze called the Sambola. And it's no coincidence that these delicate damsels are named after flowers, since another part of their mission is to introduce bodily hygiene into the population of a disreputable male dormitory by distributing fragrant soap. Radiating pretentious self-confidence, wide-eyed Greta Gerwig embodies the observant, judgmental visionary, spouting vaguely intellectualized cliches while maintaining her vacuous equilibrium as petty conflicts erupt around her. Certainly Whit Stillman knows the rarefied world of the privileged classes well, since his godfather was eminent sociologist Digby Baltzell, who first coined the term WASP to denote White Anglo-Saxon Protestant. On the Granger Movie Gauge of 1 to 10, "Damsels in Distress" is a stylized, slightly surreal 6, perhaps overdosing with flimsy whimsy.